Brazil got back to winning ways by beating Ghana 1-0 in a friendly at Craven Cottage in London. To be honest though it was another poor performance from Mano Menezes’ boys and Brazil only started to dominate the game after Ghana had a man sent off on 33 minutes. It was another disappointing evening for Ganso who has had so many for Brazil and Santos over the last few months; he limped off with a muscle injury after just eight minutes. Mano Menezes then infuriated Brazil and pretty much everybody who takes an interest in the beautiful game by putting on defensive midfielder Elias in his place. To be fair to Elias I actually thought he had quite a good game but the negative knee jerk reaction by Mano Menezes was not cool. Not cool, okay! Leandro Damião scored the only goal of the game and his first international goal. He finished very well after being sent through by a good Fernandinho pass. Apart from that pass, the unknown Fernandinho was terrible and replaced at half time. Now, the question is, why is this Shakhtar reserve starting in the centre of midfield for Brazil? Local influential commentator Juca Kfouri recently posted on his blog: “Fernandinho is a joke. A Shakhtar Donetsk reserve, a poor version of Felipe Melo but part of the same commercial group as Mano Menezes”. That is the only plausible reason I can think of that he is in the team ahead of the likes of Hernanes, Anderson, Arouca, Elias, Sandro, Luiz Gustavo to name a few. Midfield is a problem for Brazil. Lucas Leiva is another one who shares the same agent (Carlos Leite) as Mano Menezes. There is more of a case for him to be included but in my humble opinion this guy is mediocre. The ultimate water carrier. Has he ever played a pass further than 10 meters? He’s not even hard, strong or fast. Brazil’s big problem: No creativity or bite in their midfield. Another couple from Mano Menezes’ group are André Santos and Renato Augusto. Sorry to be the bearer of bad news Arsenal fans but André Santos doesn’t hack it. Were it not for Mano Menezes’ generosity, I doubt that André Santos would have played enough international games to get his work permit to play in England. And what has Renato Augusto ever done? Anyway, back to the match. Ghana and Opare can have no complaints about the red card. He was kicking lumps out of Neymar and had been warned several times by the referee when he was already on a yellow card. He was finally given a second yellow and sent off for a foul on Lucio. If it were a competitive game, he surely would already have been sent off. No complaints there. And it was from there on (the 33rd minute) that Brazil started to dominate. Playing against ten men can be difficult at times. But Brazil did it well and kept possession of the ball. Ghana hardly created any chances after that. Ronaldinho pulled the strings throughout and I got the feeling that his presence on the field helped take the pressure off the likes of Neymar and Leandro Damião. Ronaldinho could have scored with a couple of well saved free kicks. But the real moment of magic came late in the game when he produced a beautiful cross for substitute Alexandre Pato. Pato tested the the keeper with an excellent header but the keeper saved brilliantly. Better from Brazil and the way they dominated possession in the second half should give them more confidence. 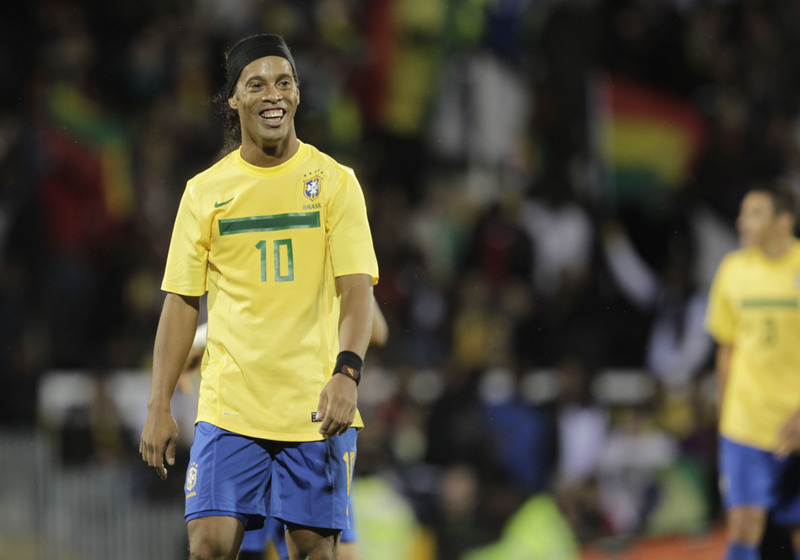 The big positive was undoubtedly Ronaldinho. There were a few other positives: Neymar had a good game; Leandro Damião scored his first goal and looked good; Marcelo made a steady comeback; no mistakes from Julio César; Hulk came on and played quite well (to be fair to Mano Menezes he put him on for Fernandinho at half time in attacking move). The downside was obviously Ganso’s injury. It looks like he’ll miss the next game against Argentina later this month. His form at fitness for both club and country is a problem. The big all important question though: when it was 11 v 11, why were Ghana on top? All due respect to Ghana who are a good team but this is Brazil. This entry was posted in Seleção and tagged Brazil, Carlos Leite, comeback, Craven Cottage, Fernandiho, friendly, Ganso, Ghana, Hulk, Leandro Damião, London, Lucas Leiva, Mano Menezes, Marcelo, Ronaldinho, seleção by Brian Davidson. Bookmark the permalink. Great piece. I agree about Ronaldinho pulling the strings and it was great to see Neymar asking big questions of the Ghana defence. I thought Marcelo was the best player on the pitch, he caused endless problems down the left and linked up superbly well with Ronaldinho and Neymar. Elias had a really good game when he came on, broke things up well and got forward when he was required. Having said all that, Brazil certainly need to improve in the final third against Argentina! I would like to see Pato starting, he looked decent when he was introduced. Bit I didn’t think much of Hulk, or The Incredible Bulk as I now prefer to call him. He’s not the thinnest! Agree that Pato looked good when he came on. I’m not a huge fan though and was happy to see Leandro Damião get the chance. He’s been scoring goals for fun here in Brazil. “Starbucks and Fair Trade: Fair prices, an improved quality of life. The way it functions reflects that its support in weight loss is dependent upon how consistently you consume Leptin Green Coffee 800 to get a longer duration. It gives me that little edge I need to get motivated and drive, cycle, and even run on the gym to get a workout in. When you are taking slimming pills and other weight-loss products, they’re usually advice to reduce on the amount of food they are eating. The significance of chlorogenic acid is who’s helps our body burn off fat better, helping to make it the primary element ingredient within the extra weight-loss qualities of green beans extract.